이희연, 하은혜,(2015).청소년 우울증상의 지속에 대한 인지취약성의 영향과 성차.한국심리학회지: 여성,20(2),157-179. 본 연구에서는 청소년 우울증상의 지속에 대한 인지요인의 영향력을 검증하기 위해 6개월 종단연구를 실시하였다. 연구목적을 위해 인지적 기능측면에 따라 사회지향성, 자율지향성, 반추반응양식, 공동반추의 네 개 인지요인이 초기 우울증상과 6개월 후 우울증상에 미치는 영향에 대해 구조방정식을 통한 검증을 실시하였다. 연구대상은 서울, 경기지역 남녀 고등학생 968명이며, 우울증상(CES-D), 성격특성(한국판 청소년용 PSI-Ⅱ), 반추반응양식(RRS), 공동반추(CRQ)의 자기보고평가를 실시하였고, 6개월 후 동일한 학생을 대상으로 우울증상(CES-D)을 평가하였다. 최종 718명의 우울증상 지속에 대한 인지요인의 영향을 연구한 결과 첫째, 초기 우울증상과 6개월 후 우울증상에서 여학생의 우울증상이 높게 나타났다. 둘째, 사회지향성과 반추반응양식이 초기 우울증상을 매개로 하여 6개월 후 우울증상에 대한 간접효과가 나타났고, 공동반추는 초기 우울증상을 매개로 하여 6개월 후 우울증상에 대한 부적인 영향이 나타났다. 셋째, 6개월 후 우울증상에 대한 인지취약성의 영향에서 성별 차이가 나타나지 않았다. 이 결과를 통해 사회지향성과 반추반응양식이 우울증상의 발현과 지속에 대한 취약성 요인으로 확인되었다. 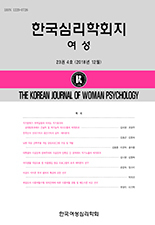 The purpose of the current study was to examine the impacts of cognitive factors such as sociotropy and autonomy as cognitive structures, ruminative response style as a cognitive process and co-rumination as a social process on persistence of depressive symptoms and identify gender differences on the relationship among constructs in a six months longitudinal study. The final participants were 718(female 308, male 410). The result showed that first, female adolescents’ depressive symptoms were showed high readings after 6 months. Second, there was indirect effects of sociotropy and ruminative response style and negative indirect effect of co-rumination on six months later depressive symptoms Also, there was no effect of autonomy on initial and six months later depressive symptoms. Third, there was only a significant gender differences of the effect of co-rumination on six months later depressive symptoms. These results confirmed that sociotropy and ruminative response style are the vulnerability factors for the onset and persistence of adolescents’ depressive symptoms but co-rumination is a protective factor for depressive symptoms. Thus, It was confirmed that impacts of the personality vulnerability factors of sociotropy and autonomy, ruminative response style and co-rumination on the depressive symptoms of adolescent in a longitudinal study.